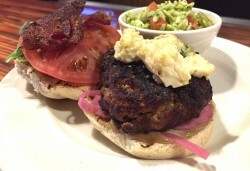 Bleu Bomber: Our Seasoned beef patty with balsamic mayo, pickled red onion, bleu cheese, bacon, arugula & tomato. Congratulations IC Class of 2016! Go Bombers!